This article describes how to record course participation for online students. You can factor attendance into the student's final course grade. If your school has a failure-for-non-attendance policy, the student's attendance grade (described in the above-linked article) will be used to calculate whether the student receives a failing grade for non-attendance (their assignment grades notwithstanding). 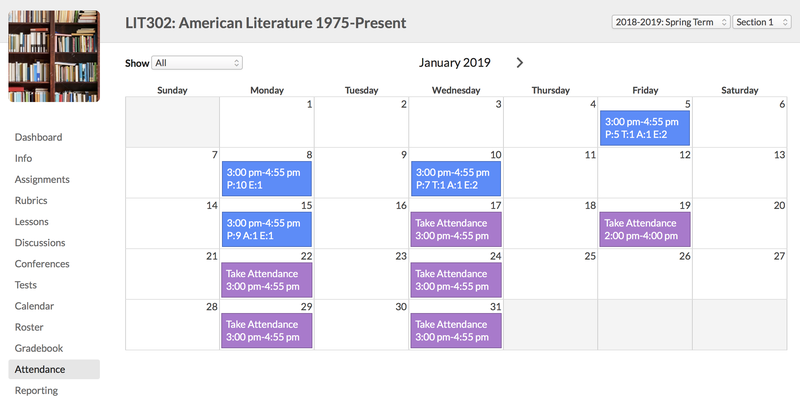 The Attendance calendar shows all of your course meeting times and any additional events you've added to your course calendar. Purple Attendance blocks indicate that you haven't taken attendance for that meeting time. Blue Attendance blocks indicate that you have taken attendance for that meeting time. You can select individual students from the drop-down to show only their stats in the calendar. 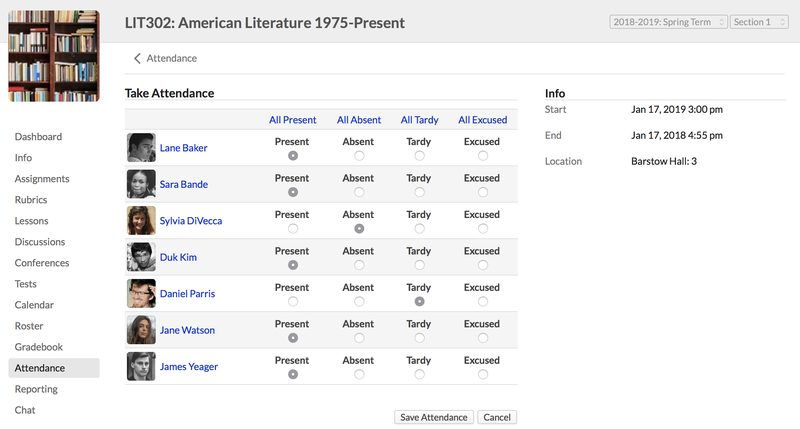 Next to each student, select the appropriate attendance status. After taking attendance, you can return to the same attendance event at any time to edit the records or even delete the records you entered. Is it possible to get an attendance report, either for the class, or for an individual student, without having to check each month on the calendar view? Would the Attendance Report in Academics > Academic Term > Attendance do the trick? We were looking for a report by class, or a more detailed report by student. Can students see their own attendance record? I agree, it would be helpful to be able to see exactly which days that student was late or absent in case a student inquires (without having to search through every day in the calendar), or in case we made a mistake that we need to fix. I also would like to be able to get a report on an individual student's attendance record for a specific class. A table that shows total number of absences, tardies, and excused absences for the term for each student in a class would be very helpful. I need my students to be able to see the summary themselves. We have an attendance policy which means that if students miss a certain number of classes (or the are late a certain number of times), they fail the class. Currently, I have to keep a close eye on the class attendance summary and send out individual e-mails alerting students of when they are coming close to failing. If students could see their attendance record themselves, I wouldn't feel the need to do this. We have our eye on it. @Andrew - If a student clicks "Detail" next to their attendance percentage under Course Stats on the course dashboard they can see how many times they have been marked present, absent, tardy, or excused. @Jennifer - Please submit a support request. Just visit this page https://support.populiweb.com/ and click "Submit a Request".